While any good portrait presents a challenge, the “environmental portrait” presents the special challenge of placing the subject in surroundings that tell us something about the person. Shooting someone in their place of work — a teacher in the classroom, a film editor in the cutting room — well achieves the goal. In the best of such portraits, the background seamlessly becomes an extension of the subject, and in the best of these, the result often moves into metaphor. props, and by props I mean almost everything except the subject himself (for if Shakespeare was right that all the world’s a stage, then the objects around us tell our story). First, we see the glasses. They occupy center stage, disdainfully lying face-down on the table. They almost distract from the subject, and by doing so tell us there’s a message here, for it’s clear that Eisenstaedt, well aware of their presence, chose to leave them as is. To my mind, they suggest that as he sits in his chair, the composer is looking within, not without. 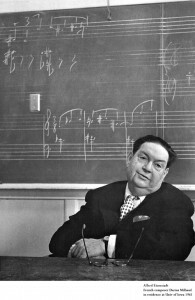 Confirmation lies in Milhaud’s dazed eyes, which also suggest he is musing more than thinking. Given who he is, one can easily surmise the composer is composing, and indeed, if we look to the blackboard behind him, we see a visual representation of that thought in the musical notes that float above. In short, the photographer has presented the environment in a manner that suggests precisely what lies in the subject’s mind — a composition. The result is an image that transcends the mundane, giving us a kind of visual poetry. white medium by giving us light/dark contrasts that energize the image with a strong graphic design. 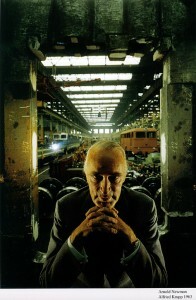 The contrast is continued by a half-lit face that adds a psychological density to the subject. Interestingly, the composer, too, obeys the rule of thirds when viewed against the gray field behind him. And the piano? It almost looks like a musical note, adding depth to the photograph by taking us, like Eisenstaedt’s portrait, into the realm of metaphor. to the grand task of tackling a grand universe. The delicately-held cigarette with ashes ready to fall, make a great prop, suggesting intensity and focus. And as we look down at the great physicist, taking in the vastness of the nothingness that surrounds him, we can’t help but feel that we’re in the presence of a visionary. To similar effect, and perhaps more concretely, the emptiness of a large blackboard dominates the later portrait of Kurt Godel. The great mathematician sits frozen in his seat, face dramatically half-lit, hands clenched and ready to spring into action, while the blackboard, clean and tidy like his mind, looms from behind, waiting to be filled. 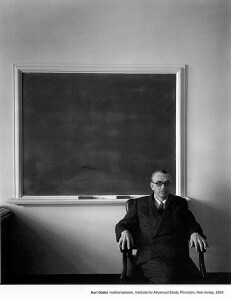 As in the Oppenheimer portrait, given the nature of pure mathematics, it isn’t difficult to surmise that the tabula rasa behind Godel represents both his mind and the abstract field of thought he must enter as builds his equations. conceives. In the Wright portrait, the photographer places the architect one-third into the photograph and one-third into a drawing which, like Eisenstaedt’s Milhaud portrait, suggests a work as a thought. 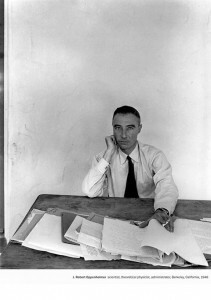 And in the Mailer portrait, where a sheet of paper is surrounded by a blank wall, the photographer conveys the isolating and daunting task that the writer must feel as he confronts his work. By placing Mailer in split lighting, Newman also tells us that his subject well knows the dark side, and in allowing Mailer to press his knuckles into the arm of the chair, the photographer portrays a well known attribute of the author: a restrained intensity ready to explode. 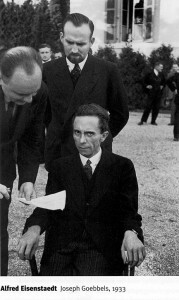 attendant subjects, the Reich Minister of Propaganda grips the arms of his chair, a document awaiting his signature, while he stares at the Jewish photographer with an aversion that is frightening. All the more frightening is the fact that here is an environmental portrait in which the subject is not acting. And in another great portrait of evil, we see Newman’s image of the German industrialist and war criminal, Alfried Krupp, looking very much like the devil. This photograph is all about the light, as explained by Newman in the below video. 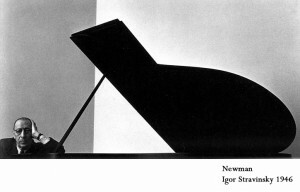 More information on Newman may be found at The Arnold Newman Archive, and in particular, one can see many of his portraits here and here. A 1981 interview of Newman from the Visions and Images series appears below. While I’m sure there are many fine books showing Newman’s portraits, one I can personally recommend is Taschen’s: Arnold Newman. In addition to essays by Newman and Philip Brookman, the book contains quality prints which inspire and instruct. For videos on Eisenstadt, take a look at youtube Eisenstaedt search. This entry was posted in masters of the medium, other photographers.